Dandruff is a common skin condition that causes dry white flakes of dead skin to appear in the scalp and/or hair. Whilst not harmful, it can look unsightly and cause the sufferer to become very conscious of their appearance. Alongside the white flakes, sufferers may also experience an itchy, scaly scalp. Dandruff can worsen during the autumn and winter, with central heating contributing to dry skin. The most common cause for dandruff is dry skin. Usually this is accompanied by signs of dry skin on other parts of the body like the arms and legs. Irregular shampooing can cause oil and skin cells to build up on the scalp, resulting in dandruff. On the flip side to this, shampooing too often or using too many styling products can also irritate your scalp and cause dandruff. Sensitivity to hair products can cause a red, itchy or scaly scalp. Dermatitis is another common cause of dandruff, recognised by red or greasy skin with flaky white or yellow scales. Those who suffer with eczema and other skin conditions are more prone to dandruff. Malassezia, a yest-like fungus, live on the scalp of adults and occasionally it can cause more skin cells to grow. When the cells die, they can cause irritation and dandruff. There are many remidies and treatments readily available in supermarkets and high street stores, including medicated shampoos, conditioners and the like. In extreme case there are even prescription medications available through GPs and pharmacists. 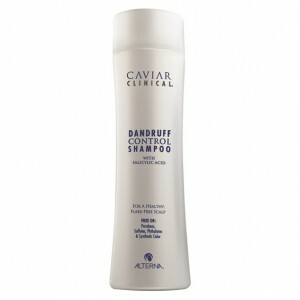 At Taylor Hughes Hairdressing we recommend Alterna Caviar Clinical Dandruff Control Shampoo and Conditioner. 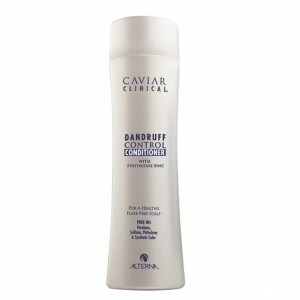 Alterna Caviar Clinical Dandruff Control Shampoo – Expertly eliminating any dryness and irritation caused by dandruff, this shampoo also helps to relieve an itchy scalp and prevent any further flakes from forming. Alterna Caviar Clinical Dandruff Control Conditioner – Helping to restore moisture to the hair and scalp, this Alterna Caviar Clinical Dandruff Control Conditioner helps relieve scalp itch, dryness and irritation caused by dandruff. Designed for everyday use, this hydrating conditioner will help to balance the scalp and prevent any future flakes and leave hair looking soft and shiny. Both of these Alterna Caviar Clinical Dandruff Control products are available via our online shop, along with many others in the Alterna Caviar range. They are they are both currently discounted, and what’s even better is you can save a further 10% when you buy in October! Simply enter promo code ‘October10’ at the checkout. If you’re still suffering with an itchy, flaky head after several weeks of experimenting with different dandruff shampoos, or if your scalp becomes red or swollen, see your doctor or dermatologist.